I had a great weekend off last week, but more about that later. 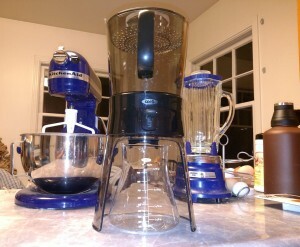 For now let me tell about my new cold brew coffee thingamajig! Cold brewed coffee is something of a trend at the moment, so I probably don’t need to explain it. If I do need to explain it then please hop on down to your local Starbucks and ask them for some; then you can be one of the cool kids too. There are lots of ways to make cold brew, it’s really pretty low tech. Being one to never pass up an entertaining gadget however, I purchased Oxo’s interpretation of a cold brew coffee maker last week and I finally had a chance to try it out today. When it arrived, it turned out to be a lot larger than I was expecting. That’s not a big deal necessarily but it’s definitely not a thing which you can throw into a drawer. 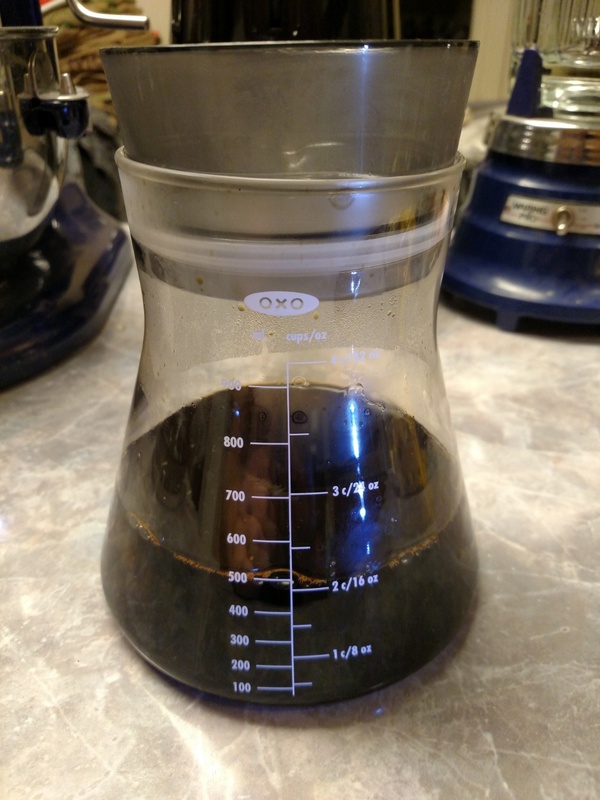 It’s essentially a plastic half gallon bucket with a filter and valve on the bottom, and a glass carafe for your brewed coffee. It also comes compete with a fifty dollar trademarked Oxo logo. The instructions call for 40 ounces of water to 10 ounces of ground coffee, which is expected to give about 26 ounces of cold brew. If you’re counting, that’s 65% yield for the input water. I used 32 ounces of water to 8 ounces of coffee because half a pound is easy to ask for at the coffee shop, and I got 16 ounces out of it. So my yield was 50%. The container holds 84 ounces to the rim, so I think I should be able to do a full pound of coffee despite the instructions recommending somewhat less. I brewed for 17 hours and then flipped the lever on the front of the unit. The drain rate was extremely slow, taking about 6 hours to finish filtering. I had to stir several times because it seemed to get stuck. I asked Peet’s for french press grind, but what they gave me was finer than I’d like. I’ll have to see if they can grind it coarser next time. I also used an optional paper filter which the instructions state isn’t necessary. Using only the stainless mesh screen which comes with the brewer might allow for the coffee to drain a bit faster. The result is very strong, as expected, and seems to have a great flavor. I’ll be waiting until tomorrow morning to make a mug of it so I’ll have to update later with my tasting impression. UPDATE: It’s enjoyable, but a bit woody or tannic. I think the extraction was a little too long owing to the combination of the 17 hour brew time and 6 hours to drain. The grind could also have perhaps contributed.